The Norwegian economy scores well above most other developed countries in measures of quality of life and governance. It is considered to be one of the best countries to live in, with a high level of life quality, low inequality and a sound welfare state. High oil exports are taxed by the government at a marginal rate of 78 percent and the money is invested in the Government Pension Fund Global, which at the end of 2016 had holdings with a total value of NOK 7 510 billion, corresponding to $170.000 per capita. Does this high level of financial security guarantee the financial stability of the Norwegian household sector? There are signs that such positive expectations for the future have led to increased risk taking by banks and households. Norway´s household debt/income ratio is currently at 235 percent, which is an increase from 125 percent in 1996. Today Norway´s debt-to-income ratio is the third highest among OECD countries. 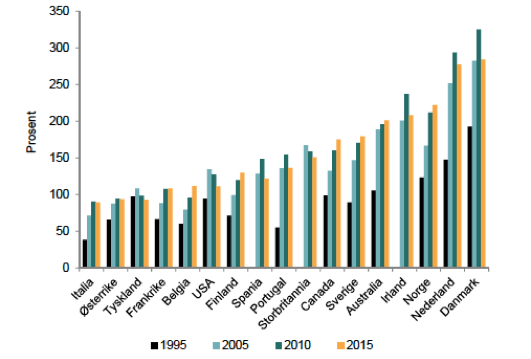 Household debt-to-disposable income ratio has fallen in many OECD countries the last years, but it has continued to grow for Norwegian households. Source: National budget 2017. Index 2003 = 100. Since the Norwegian housing market was deregulated in the 1980s, it has become one of the most liberal in Europe. Real estate is a profitable source of speculation and generates large income disparities. Those who have the means, invest in several apartments in central parts of cities or provide guarantees for their children so that they can take on an ever-increasing debt burden. (Gulbrandsen, 2016) While the post-war generation experienced their house prices double, triple and quadruple after the deregulation in the 1980s, the same price increases have become a driver of indebtedness for the generations that followed. Due, to the simultaneous deregulation of the banking sector the adequate credit has been provided to fuel this market. The question is how long this can last, and what will happen if the rising debt levels can no longer continue. The credit growth has eased since 2008, but still household debt has been growing at a rate between 6 and 8 percent for the past five years. On the aggregate, household debt to disposable income levels are now at 235%, among the highest in OECD. In 1996 debt-to-income ratio was at 125 percent. National and international agencies conclude that there is a substantial reason to be worried (IMF 2015, OECD 2012, Finanstilsynet 2016) and the Norwegian government has introduced stricter bank regulations since the financial crisis with the prospect of slowing down private credit growth. Yet, household debt has been growing by more than five percent every year since the financial crisis, outpacing wage growth and increasing the household debt burden every year. Another important question is whether the Norwegian debt level is at a tipping point and about to reach a debt crisis. Richard Vague argues that a threshold for a safe private debt/GDP is 150 percent. For Norway, the private debt/GDP ratio reached at 243 percent in 2016 (BIS). Vague argues that for large economies, private loan to a GDP growth of roughly 18 percent or more in five years is the level where that growth is excessive. (Vague, 2014) In Norway, private debt to GDP grew by 11.3 percent in the five-year period up until 2016. The current debt growth might not be excessive following Vague´s definition, but 11 percent is very high when you consider the it has grown from an already record high. Private debt to GDP was at 234 percent in 2015, rising to 243 percent in 2016. Based on this method, Steve Keene has put Norway on his list over countries most likely to have a debt crisis. To make it to the list countries had to have a private debt to GDP ratio exceeding 175% of GDP and an increase in private debt in the past year exceeding 10% of GDP. 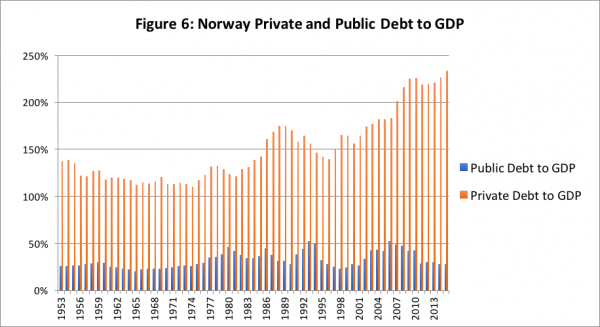 Norway´s private debt to GDP ratio has been growing rapidly since 1995, reaching 243 percent in 2016. Norway´s debt level is significantly beyond this level. It is hard to predict exactly when this will lead to problems for the Norwegian economy, but there is a high certainty that it will. Housing related debt cannot keep rising forever, and when households start deleveraging this will affect growth and consumption spending. While much of the political debate in Norway is centered around the fragility of certain low-income households, and whether the housing market should be described as "a bubble" – or not, not much discussion is centered around the future of Norway´s economy if households start deleveraging. According to Jordà et al, a mortgage boom is a predictor of considerable slower growth rate into the future. Why has household debt risen so significantly over the past decades in Norway? Are housing prices the driving factor, or is it rather banks eagerness to profit from mortgage lending that is pushing up housing prices? I will look at both demand and supply of housing, and the supply and demand of credit when trying to answer this question. 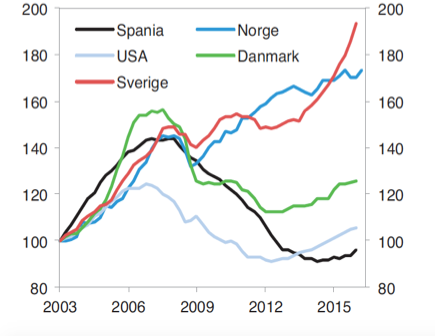 80 percent of lending to households is mortgage lending, and Norway´s household debt is tightly connected to the rising housing prices, as presented in the following graph made by Steve Keen. It shows how the change in household mortgage debt as a percentage of GDP correlates with the percent change in house prices. Research by Jordà, Schularick, and Taylor shows that the role of banks has changed in the past 45 years. In their estimation "with very few exceptions, the banks´ primary business consisted of non-mortgage lending to companies both in 1928 and 1970." In 2007, banks in most countries had turned primarily into real estate lenders. "The intermediation of household savings for productive investment in the business sector – the standard textbook role of the financial sector – constitutes only a minor share of the business of banking today." (2014, p.2) They find that in relation to GDP, non-mortgage bank lending to companies and households has remained stable, with "virtually all of the increase in the size of the financial sector stemming from a boom in mortgage lending to households." (p. 39) As shown clearly in the following graph from IMF (2016), this story fits well with Norwegian data. 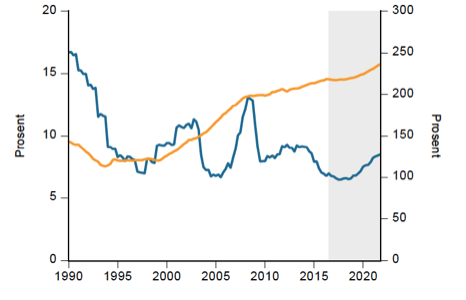 Lending to nonfinancial corporations has been falling steadily since 2009 while the percentage of residential mortgage loans has been increasing. Figure 9: Bank lending to corporate borrowers has been weak since 2008. Adair Turner points out that in many advanced countries the value of housing accounts for more than half of all wealth, and that in France and UK the growth of housing wealth relative to national income explains about 90 – 100% of the total increase in the wealth/income ratio since 1970. According to Norway´s Statistical Agency, Norwegian households have experienced a strong increase in their net wealth the past year, which they report is mainly due to the increase in housing prices. From 2010 to 2015 average net wealth for households increased by 25.6 percent in fixed prices. A popular sentiment in Norway is that growing housing prices increase household wealth. This attitude is re-enforced by common refrains from the press which reports positive stories about "House prices reaching new highs." The high net wealth of Norwegian households makes many commentators less concerned about rising debt. The common argument goes that as long as household assets are larger than liabilities, everything should be fine. Such opinions, however, assume perfect liquidity. 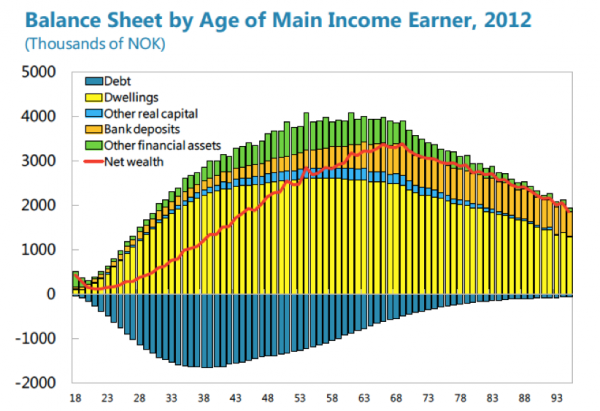 The following chart shows household balance sheets for different age groups, including net wealth. It indicates high positive numbers for net wealth and solid balance sheets for all age groups. However, in economic downturns, much of the wealth on the asset side for the households will not be liquid assets, but still, the liabilities will have to be paid. Figure 10: Net wealth includes the market value of houses (dwellings). Additionally, mortgage lending seems like a lower risk project for banks, because they can give loans with security against real estate. Consumers need loans to outbid other consumers in the search for desirable properties, and banks are generally willing to provide that credit. Bank lending to real estate, therefore, creates a self-reinforcing process where the supply of credit, demand for loans and housing prices spiral upwards. One of the reasons why this upward spiral of housing prices and mortgage loans has become so strong in Norway is partly linked to the lack of regulation in the Norwegian housing market. Compared to countries like Germany, Sweden, and Denmark, Norway has practically no price regulations or public housing. In fact, after the deregulations in the 1980s and 1990s, the housing market is now one of the most marked liberal in Europe. The rental market is not considered very stable and to the extent that they are able to, young households try to buy their own homes. With no viable alternative to getting a huge mortgage and buying your own home, the pressure on real estate and soaring prices has led to wave of speculation. The Norwegian tax system includes strong incentives for home ownership and holding debt. Mortgage interest payments are tax deductible and housing is subject to a lower wealth tax than other assets (IMF 2015 p. 12). Property taxes are generally low or non-existing, depending on the municipality. In an attempt to reduce speculation, taxes on secondary housing has been increasing the past five years. This, however, has been done through the wealth tax, which means that you only pay if your wealth is substantially larger than your debts. All of this explains why real estate has become a very lucrative investment option. While Adair Turner explains how some general tendencies in rich societies have led to increased house prices and household debt in many countries, the particularities of the liberalized housing market in Norway explain why household debt is now reaching record heights. With house prices doubling from 2005 to 2015, home owners have experienced a substantial increase in their wealth. At the same time, new generations must take on an ever-increasing debt burden. Young households who bought houses in 2016 had a debt to income ratio of 371 percent on average. (Finanstilsynet 2016, p. 50). There are few signs that the price increase has been followed by a boom in supply. Many therefore blame the rising housing prices on strict regulations on housing constructions. Norway has strict rules concerning access to light and air inside new apartments, as well as regulations on apartment size, wheel-chair accessibility, etc. The developers claim this is the reason for the increasing housing prices. (NRK, 2014) Combined with land regulations, developers argue that over regulation leads to a lack of supply. At the same time, there is a strong increase in demand as many people are drawn to the cities because of employment possibilities, both from other parts of Norway and from Europe. While some blame the increased prices on the lack of supply and increase in demand, others point out how banks are willing to give people loans 3 – 5 times their income, making it possible for people to add a year's salary on top of the listed price in the heat of bidding. Mian, Sufi and Verner (2015) reference two broad hypotheses relating household debt to business cycles. The "credit demand hypothesis" and the "credit supply hypothesis." The credit demand hypothesis "posits a positive relationship between current household borrowing and future income." Households that expect higher income in the future because of for example a productivity or technology shock, increase their lending so that they can start consuming today. In Norway, a booming oil economy could possibly lead to these types of increased expectations. However, according to the credit supply hypothesis, it is the availability of credit that pushes increased household borrowing. Credit expansions can be driven by credit supply shocks, such as a relaxation in lending constraints. For a given interest rate and potential borrower, lenders are willing to lend more or on cheaper terms. 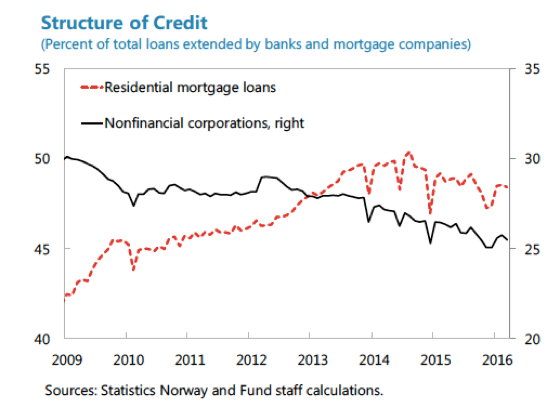 There has not been a relaxation of lending constraints in Norway, but there are other signs that increased credit supply is an important push-factor for household debt. Mian et al. mention that one of the reasons why lenders may expand the supply of available credit is the adoption of a securitization technology (Justiniano et al. (2015)), which has happened to a large extent in Norway. Since 2007 Norwegian banks started securitizing mortgaged loans and selling them off to residential mortgage companies, owned by the same banks. These bonds are traded among banks and function as other banks assets, and represent around 20 percent of bank financing. Only mortgages with low Loan-to-Value ratios can be securitized in this way. (Finanstilsynet, 2016, s. 24) These bonds are viewed as safe assets for the bank and can possibly help banks increase lending. Jordà et al. explain how bank regulations have provided incentives for banks to expand their mortgage business. (p.18) In the 1988 Basel Accord, minimum capital requirements for banks and different risk weights for assets on banks´ balance sheets were introduced. Loans secured by mortgages on residential properties now only carried half the risk weight of loans to companies. Banks could now give out mortgage loans with higher leverage across Europe. 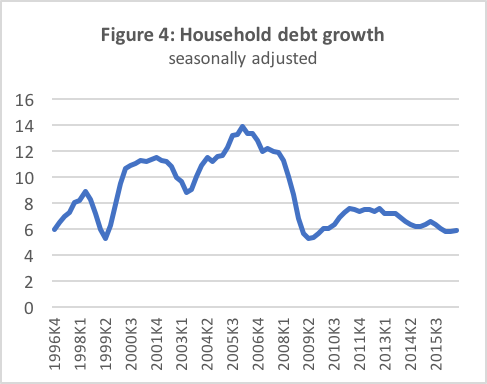 To understand the rising household debt in Norway one must look at both changes in supply and demand for houses and the supply and demand for credit. To a certain extent, all factors play a significant role. But it is certainly true that house prices in central areas could not have reached its current levels if the banks were not willing to provide the loans to purchase houses at those prices. So why are banks willing to give young people loans that are 3 – 5 times larger than their annual income? The answer is not very complicated, it is because it is a lucrative business. Risks are perceived as low as Norwegian households tend to prioritize repaying loans before other expenditures. On the credit demand side, there is no doubt that low-interest rates and cheap access to credit explain a lot. Interest rates fell from 14 percent in 1986 to below 2 percent in 2016 (See figure 11). Even though Norwegians use over 30 percent of their income on expenses related to housing (rent, mortgages, electricity) (SSB, 2012), households only spent an average 7 percent of their income on interests (Finanstilsynet 2015 s. 52). 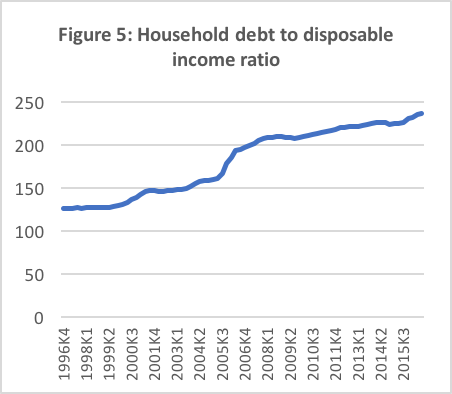 The yellow line on figure 12 shows how household debt levels are at a record high, but still households are using a very small percentage of their budget on paying interests (blue line). While the blue line shows household expenditure on interest payments (left axis), the yellow line shows the debt-to-income ratio (right axis). Projections until 2020 made by the FSA. According to the Financial Supervisory Authority of Norway (FSA), if interest rates increase many households will experience a substantial fall in disposable income. A large proportion of households have high debt levels and small financial buffers in the form of deposits and equity. (Finanstilsynet 2016 p. 53) If there is a significant fall in real estate prices and equity prices, large groups of households can end up with negative equity, where the value of their assets is lower than the value of their debt. This is especially relevant for young households, who have small financial buffers and high mortgage debt. According to the IMF Country report for Norway from 2015, Norwegian banks have strong capital ratios and high requirements for risk-weighted capital. But they still conclude that the risks for the Norwegian economy are high. The IMF is particularly concerned about Norwegian banks' dependence on wholesale funding. Banks' wholesale funding increased from 20 percent of total assets in 1995 to over 50 percent in 2008. According to the IMF, this reflects structural issues. Households borrow from banks, but financial savings are not predominantly held in bank deposits but rather in pension and mutual funds. Savings are then channeled to the banks through institutional investors and covered bond issuance, creating a self-reinforcing cycle between credit growth and increasing wholesale funding (IMF p. 18). Moreover, 60 percent of bank market financing is foreign debt, and a large portion of this is 3-month short term debt. This makes Norwegian banks highly exposed to international instability. Another source of risk fragility is the fact that loans are not diversified, but exposed to common external shocks, especially to real estate markets. 62% of bank lending goes to the financing of mortgages and other retail loans, 13% to commercial property, 11% to shipping. 85% of lending to households is secured against dwellings, mostly at floating rates. (IMF, 2015) Almost half of all business sector loans are to companies that manage or invest in real estate (mostly of commercial real estate). The annual report from the Financial Supervisory Authority of Norway (FSA), (Finanstilsynet 2016) includes an assessment of the Norwegian banking sector. It reports that many banks are exposed to businesses that are strongly affected by the recent fall in oil prices. However, they conclude that the exposure is not so large that it represents a threat to bank solidity, at least not as an isolated event (Finanstilsynet p. 62). Also, the non-oil related sector of the economy is still growing. If, however, the negative effects of the fall in oil prices spread to the rest of the economy, the banks will have larger challenges. Norwegian authorities are very worried about the household debt situation, and the risks of financial instability (Ministry of Finance, 2016). They have taken a wide range of macroprudential measures to address systemic risks, such as higher capital requirements for banks. Since 2011 there has been an 85% Loan-to-Value requirement, but the current finance minister promised to remove this during the 2013 election campaign, claiming it was making it too difficult for people to buy homes. After the elections, she changed the requirement allowing banks some leeway for 10% of the value of their loans. While official documents are filled with strong warnings about the prospects of a credit crisis, the current government seems to be more concerned about securing peoples right to get loans and buy homes in a heated market. However, in 2017 there were some important changes in regulations, and loans can no longer be larger than five times household income. There are still some strong tax incentives for home ownership that the government does not seem to have any plans to remove. Mortgage interest payments are tax deductible, and primary housing is subject to a lower wealth tax than other assets, at approximately 20-25 % of market value. There is no capital gains tax if a house has been owned for more than a year, which also applies to second and third properties. (IMF p. 12). A question that is not posed in the reports by the IMF or the Financial Supervisory Authority, is how much of the Norwegian economy is driven by the housing market. When banks give out loans they are creating new purchasing power in the economy. This money is to a large extent, itself, put into the housing market, which some people are profiting from. That money is then spent and reinvested in the economy, creating growth and demand. The trend of using your increased housing wealth to get a line of credit is in a sense a way of using your house as a credit card, it is a process where banks create money "out of nothing," with security in your house. The money is spent on refurnishing, buying cottages, cars or helping kids put down a down-payment on their apartment. How much money is being injected into the Norwegian economy every year through this mechanism? How many cars are bought, carpenters hired and bathroom tiles purchased with this money? How much extra demand is injected into the economy, and what happens if it stops? According to the Financial Supervisory Authority the high household debt levels, combined with a debt growth that outpaces income growth, is a major risk factor for the financial stability of Norway. They conclude that if households have to reduce consumption and house investments to repay their debts, this can have severe consequences for the financial stability of the private sector as a whole. (Finanstilsynet, 2016, s. 15) If there is a large fall in house prices, groups of households will end up with negative equity. This is especially problematic for young households have small financial buffers and high mortgages. While the financial supervisory authorities mainly look at whether households will be able to repay their loans, and how bank balance sheets will be affected if they don´t, recent research suggests that high debt levels can make the economy fragile, even if household and bank balance sheets seem solid. 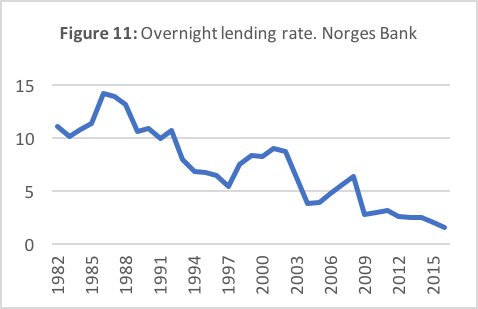 In fact, the Norwegian population´s propensity to repay their loans before other expenses might be exactly why the increased debt levels pose a risk to the economy. Recent research by Mian et al (Mian, Sufi, & Verner, 2015) concludes that an increase in the household debt to GDP ratio in the medium run predicts lower subsequent GDP growth and higher unemployment. The explanation for this is quite simple: at some point the debt must be repaid, and with deleveraging GDP growth falls. They present a strong empirical result showing that an increase in household debt to GDP ratio over a three-year period in a given country predicts subsequently lower output growth. This correlation is unique to household debt; there is no such relation for non-financial firm debt. On the positive side for Norway, which still has its own currency, they show that the negative relation between the change in household debt to GDP and subsequent output growth is stronger for countries that face stricter monetary policy constraints, as measured by a less flexible exchange rate regime, proximity to the zero lower bound, or more external borrowing. Following this line of analysis, there is a possibility that Norway has engineered structural problems in its economy. The political ideal of home ownership combined with strong tax incentives for owning your own home and holding debt has created grounds for speculation and an upward spiral of housing prices and household debt. This privileging of home ownership combined with low levels of regulation has created a system where some buy many homes while others have the choice between an unstable rental market or taking on record levels of debt. With 70 percent of the population being home owners and a very powerful Association of Home Owners (Huseiernes Landsforening), it has been politically costly to change this system. 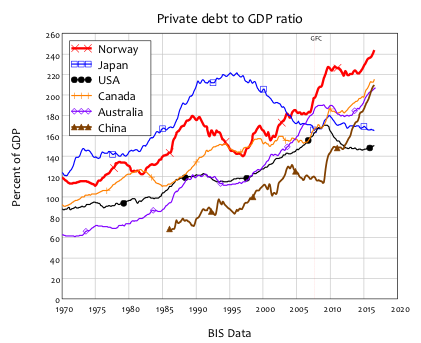 Consequently, the housing market has become one of the largest generators of inequality in the Norwegian society. Whether your parents can walk in with you into the bank and help you take on debt 3 - 4 times your income determines whether you are on the inside or the outside of a market where prices have been galloping upwards for years. Those with means to own several properties have experienced a large increase in their wealth. But even though rising housing prices make the common home owner feel wealthier, it is wealth that is hard to liquidate if you still need somewhere to live. While some families take advantage of the price increase on their own home to help their children´s entry into the housing market, many quickly realize that it can be difficult to use your real estate wealth to help more than one son or daughter. Adair Turner highlights some general tendencies in global housing markets that lead to excessive household debt and macroeconomic instability. But there are many exceptions to this rule. One good example is Germany, where extensive use of public housing, regulation, and secure rental markets has led to a home ownership rate of only 50 percent. Many point to German prudence to explain why Germans are not taking on as much debt as their neighbors. But instead of looking at cultural stereotypes, it might be more fruitful to look at the housing markets. If there is no need to take on excessive debt to provide a stable home for your family, then it is reasonable for households, and banks, to behave in a manner that is more in line with national financial stability? The most striking data describing Norwegian households are the fact that so many households have debt that is 3 – 5 times their income, and that these are mostly young families. Their balance sheets might look positive when the market value of their newly purchased house is included in the net wealth, but that does not leave them in a less fragile position if they experience job loss or the housing bubble bursts at the same time as interest rates increase. From 1985 to 2013, house prices deflated by consumer prices rose by 200 percent (IMF, 2015), creating a wall of debt for the next generation. The old system didn´t work perfectly, but the deregulated housing market has become a major destabilizing factor for an otherwise strong economy. If a recession hits, the government will have to use the oil fund to boost demand. But those funds are supposed to be saved for the pensions of future generations, not be spent to repair the excesses of previous ones. Correction: This article has been updated to reflect new Norwegian policies regarding lending standards 08/01/2017. Boye, E. (2013). Før det smeller. Politiske tiltak mot ekstreme boligpriser. Manifest Tankesmie. Finanstilsynet. (2016). Finansielle utviklingstrekk. The Financial Supervisory Authority of Norway. Gulbrandsen, L. (2016). Nordmenns gjeld og formue høsten 2015. Oslo: Velferdsforskningsintsituttet NOVA, HiOA. IMF. (2015). IMF Country Report No. 15/257. IMF. (2016). IMF Country Report No. 16/214. Jordà, Ò., Schularick, M., & Taylor, A. M. (2014, September). 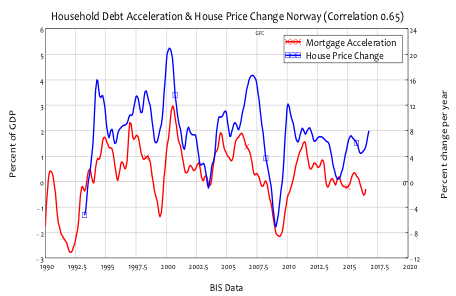 The Great Mortgaging: Housing Finance, Crises, and Business Cycles. NBER Working Paper No. 20501. Knoll, Katharina, S. M., & Thomas. (2014). No Price Like Home: Global House Prices, 1870 – 2012. CEPR Discussion Paper No. DP10166. Mian, A., Sufi, A., & Verner, E. (2015, September). Household Debt and Business Cycles Worldwide. NBER, Working Paper 21581. Ministry of Finance. (2016). National Budget 2017. OECD. (2012). OECD Economic Surveys Norway. SSB. (2017). Økonomiske analyser 1/2017, chapter 6: Households. Turner, A. (2015). Between Debt and the Devil. Money, Credit, and Fixing Global Finance. Princeton University Press. Vague, R. (2014). The Next Economic Disaster: Why It's Coming and How to Avoid It (Vol. Kindle Edition). University of Pennsylvania Press.